I don't always clone beers, but when I do, I clone Dos Equis. Actually, that's a lie: while I *don't* usually clone beers (it's only my second), I am certainly not going to clone Dos Equis. No offense to "The Most Interesting Man in the World," but we have radically different tastes in beer. However, when I do decide to clone a beer, I try to look towards a beer that I consider a hallmark of the style. 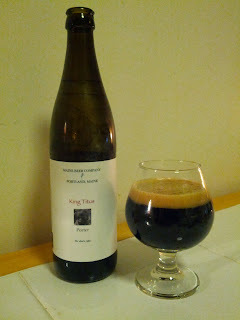 And when it comes to Porters, I cannot think of a better example than King Titus. King Titus is a Robust American Porter brewed by Maine Beer Company. At 7.5%, it's big and full of tons of character. The brewer describes the beer as a "take on an American robust porter. Dark, thick, chewy, chocolaty, and of course, generously hopped." Appearance: Pretty thick black with a tan head, little to no light penetration. Aroma: Full of chocolate. I'm not getting a much for hops in the aroma at all. Flavor: Dark chocolate with an almost lacto (milky) presence; super smooth. A little bit of roasted coffee in the background, balanced with faint candied orange peel. Leaves a long bitter finish. The hops are clearly there as they balance out the sweetness of the body, but I wouldn't say this is a hoppy beer. Mouthfeel: A thick milkshake with lots of body. In terms of my own recipe, I wanted to stay as close to the original recipe as I could though I did make a couple small changes that I expect will complement the final product nicely. 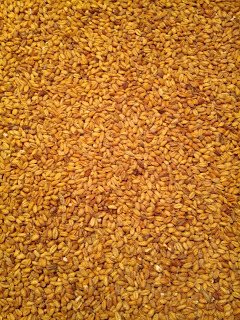 The grain bill was easy enough, though I changed the percentages several times before finally deciding. In an effort to replicate the bigger body of the beer, I tried to mash in a little higher than usual (154°) using a single infusion mash (which is typical for my home system). When my homebrew store didn't carry Roasted Wheat, I decided to roast my own. 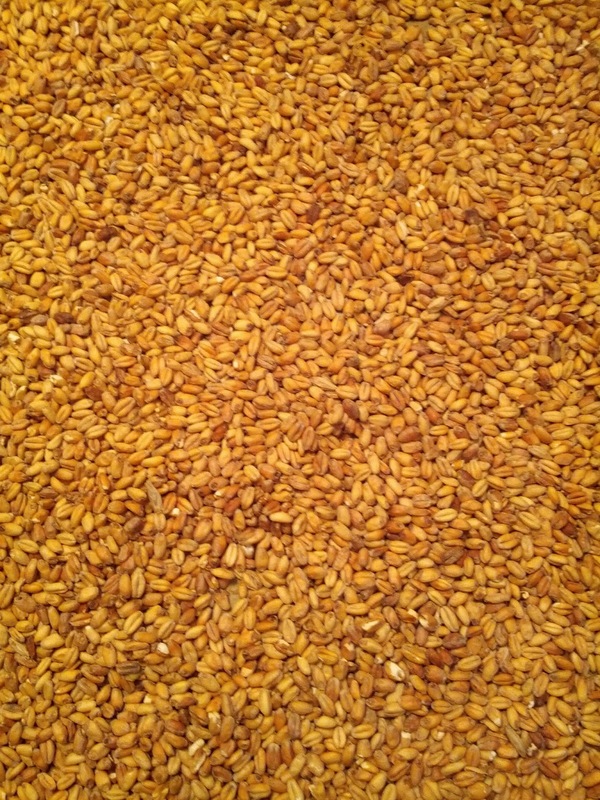 I found the process so tremendously easy and pleasing that I'm fairly certain I will roast my own grains from now on. I simply put a pound of un-milled wheat on a cookie sheet and baked in the oven at 400° until they were nicely browned and I could smell them. They smelled absolutely fantastic and had a most wonderful nutty flavor. I let them cool overnight, milled them the next day, and added them to the mash. I got a little stuck when considering the hops. The last tagline of the brewer's description ("generously hopped") sort of threw me off. The hop presence of the beer is minimal at best, with only a vague earthiness in the background of the mouth. It is my estimation that the hops primarily serve to balance the beer and prevent a boozy character. Thus, I opted for roughly 68 IBUs with hop additions at 60, 20, and 15 thinking that this would serve to balance the beer, while leaving some faint hop flavors without being described as "hoppy." Though MBC doesn't list the IBUs on King Titus, Founders lists their Breakfast Stout (a comparable porter/stout in my opinion) at 60 IBUs, thus leaving my beer a little more generously hopped. I opted for Magnum as opposed to Columbus for the simple reason that I mixed up when I bought them (Magnum is used in their stout, Mean Old Tom.) Considering I'm using these hops as bittering hops anyhow, I expect no major change in the finished product. For yeast, I decided to try a simple yeast blend with of both 1054 and 1272 (WYeast American Ale and American Ale II). My hope is that they balance each other out, bringing out the best characteristics of both the hops and the malts in the finished product. Single infusion mash at 154° for sixty minutes. And the name of the beer? King Titus (named after an ape) reminded me of King David (don't ask! ), who is credited with the authorship of most of the Psalms. How did this beer turn out compared to the original? I just cracked open the first bottle on Monday. It was a little undercarbed still, but gave me some idea. My version surprised me by being a bit smokier than the original; perhaps too much roasted wheat? The mouthfeel was exactly right, and the aroma was fairly close (the smokiness was only in the flavor). It lacked the roundness of the MBC version, but as it warmed it started to get closer. I'll be popping another one open tomorrow and I hope to do a side-by-side. Once I do, I'll be posting notes. I was interested in brewing this. Were you happy with how this turned out in the end? Would you make any changes? I would make some changes. It wasn't bad at all, and there were aspects that were really close. But the roastiness of mine wasn't right, and it wasn't quite as thick. As for changes: first, even if the recipe stayed as is, I'd up the mash temp to 158° and raise the amount of grains to compensate. A little more body would be in order, I think, and the lower mash temp left it a hair too thin by comparison. I would be tempted to cut back on the roasted wheat, and maybe sub in Chocolate Wheat instead. I also think I'd stick to American Ale II and leave out I.
Lastly, I'd consider upping the late hops a bit. The original has a bit more of a dry hopped character that plays off the chocolate malt notes really well, and that wasn't as present in mine. Did you ever brew this again? What temp did you ferment at and for how long? Did you use a secondary? Also, any reason why you used CaraStan rather than Caramel 40L? I never did brew it again. I ended up completely redoing the recipe (no longer an attempt at a clone) and designed a stout recipe I much prefer. I did not a secondary. By that point, I had basically stopped doing secondary for any of my beers that weren't getting a prolonger lagering time, as both homebrew research and my own personal experience showed it to not matter. I just left it in primary for four weeks to clean itself up. If I were to do it again, I'd cold brew the roasted grains ahead of time, and add that to the final boil (last 15 minutes). There was a little too much of a roasted character by mashing all the ingredients together. Good luck with your version, and let me know how it turns out!